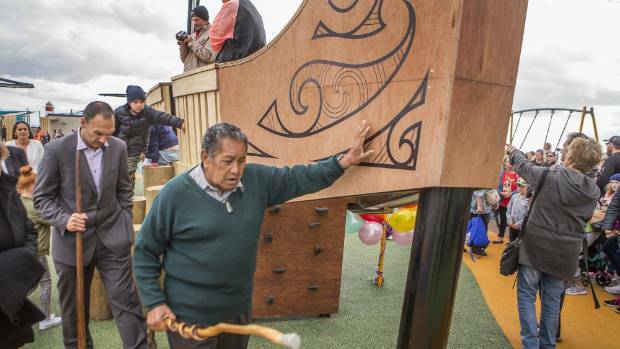 A waka-themed climbing structure is blessed at the opening of the New Brighton beachside playground. You needn’t look far through the Christchurch rebuild to see the hand of the Matapopore Charitable Trust. 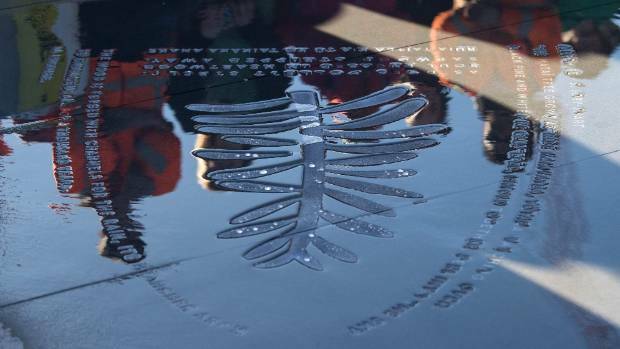 Designs sandblasted onto buildings, poems etched into stone paths, new artworks, native plantings, and te reo names for new buildings all reinforce its work. 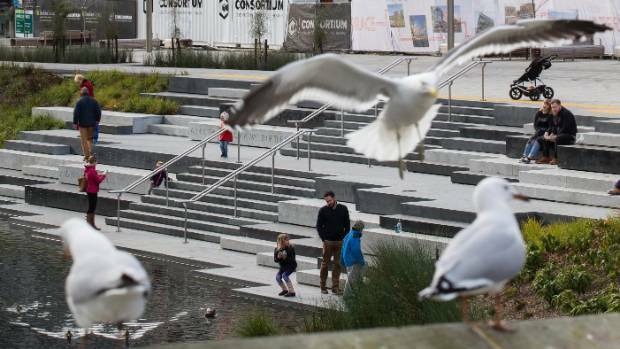 Jointly set up by the Canterbury Earthquake Recovery Authority (Cera) and Ngāi Tahu in 2014, the trust gives cultural advice on the rebuild anchor projects. It has invoiced taxpayers and ratepayers for about $2.5 million of consultancy work since then. 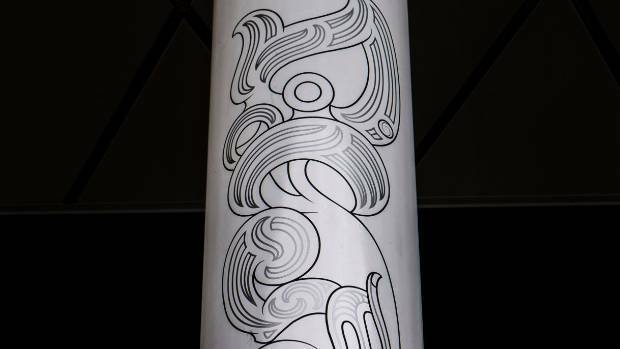 A Maori motif decorates a post at Christchurch’s new bus interchange. Matapopore, which has a monopoly on Māori consultancy for the public anchor projects, describes itself as representing the iwi’s “values, narratives and aspirations”. It has charitable status based on the educational value of its work, and some proceeds going back to the iwi. The unusual arrangement follows Ngāi Tahu and local hapu (sub-tribe) Ngāi Tūāhuriri receiving special recognition in post-earthquake legislation as a rebuild partner to be consulted during the city’s recovery. Matapopore Trust art adviser Tui Falwasser, left, chair Aroha Reriti-Crofts, and trust general manager Debbie Tikao at the opening of the Terraces by the Avon River. They stand above the words of Wiremu Te Uki. Since its inception the trust’s peak staff of 10 has been whittled to three, plus two consultants. They have expertise on landscape design, arts, te reo, and the natural environment, give cultural and historical advice, and do translations and naming research. They recommend and commission but do not pay for the artists and craftspeople, and arrange openings and blessings of rebuild projects. 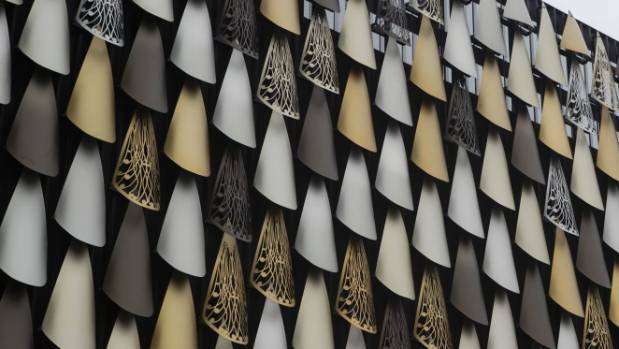 An artwork by Lonnie Hutchinson on the justice and emergency services building represents a cloak of kakapo feathers and hides parked cars. 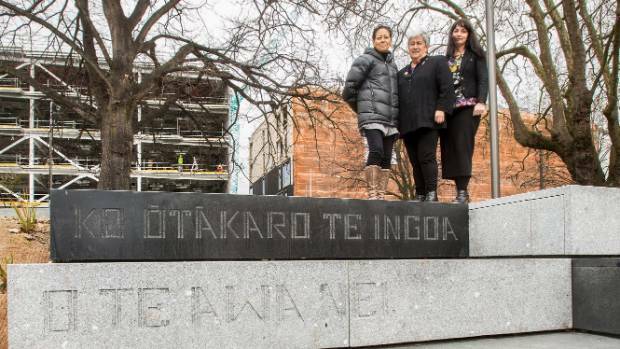 Matapopore made headlines when the Christchurch City Council’s claim of Ngāi Tahu “gifting” the name Taiora to the new QEII Park Leisure Centre seemed to conflict with ratepayers’ $38,000 payment to the trust for cultural advice, including naming research. The council insisted the name was a gift despite the bill, and that it paid for “wider cultural advice that accompanies and enriches the story of the gift”. So without a competitor, is Matapopore giving ratepayers and taxpayers a fair deal? Or, as the point of the arrangement is to stamp Ngāi Tahu’s identity on the rebuild, is that not the point? Leaf and seed designs by Jennifer Rendall on low walls in the reopened Victoria Square represent local flora. Asking those organisations what they are paying for leads to public service-style answers including “supporting narratives by developing a greater depth of understanding of … values, traditions and concepts”, “integrated into the design process to form a bridge between historical narratives and design”, and “builds the foundation for a range of outcomes including environmental, cultural, social, and educational”. Native eels feature on splash pads painted by Priscilla Cowie at the Margaret Mahy playground. An answer from Matapopore’s general manager, Debbie Tikao, is more helpful. Tikao says its input is not a superficial layer over the rebuild anchor projects but is “in the bones” of those projects. 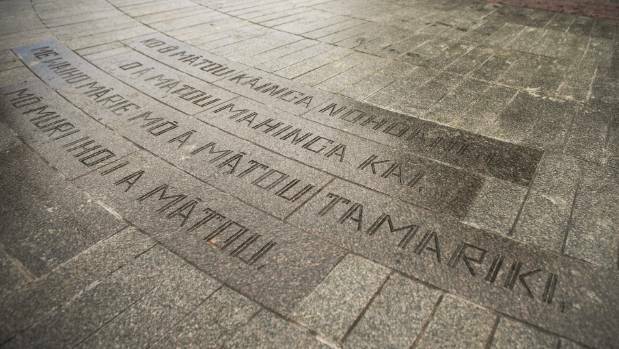 The literary trail along the River Avon includes writings in both te reo Maori and English. MONOPOLY OR LEGITIMATE VOICE FOR THE REGION? Sacha McMeeking, the head of Canterbury University’s School of Māori and Indigenous Studies, says attaching the monopoly label to Matapopore’s rebuild role is misleading. As mana whenua, the iwi with authority over the land, Ngāi Tahu has a mandate similar to a local council, she says. A whāriki or welcome mat, in Victoria Square is one of 13 in the central city. McMeeking stresses that Matapopore’s contribution is adding to, not taking away from, what Christchurch has. “Quite often when things Māori have got a political bent, there is an emotional response from some of the community that they are are being excluded, or their history is being excluded. That’s never the intended consequence. The Terraces form part of the Avon River precinct and are decorated with a poem by Apirana Taylor. However, the arrangement worries the Taxpayers’ Union. 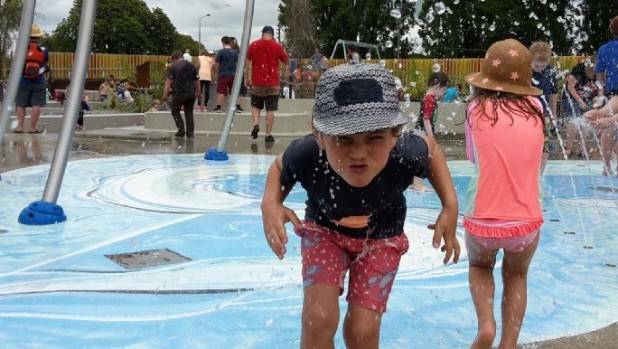 “It is always concerning when an organisation like Ngai Tāhu lobbies to ensure a council seeks cultural advice, and then positions itself as the key provider of that advice,” says union spokesman Louis Houlbrooke. 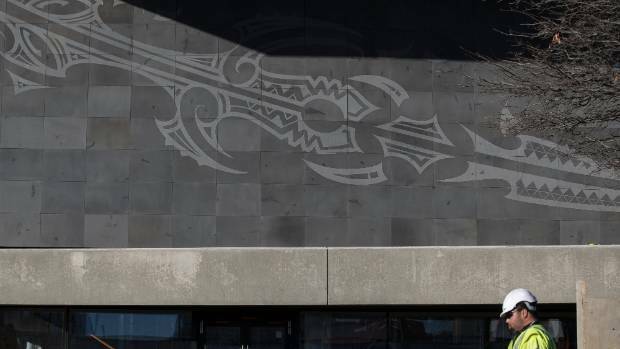 This artwork, sandblasted into bluestone on the wall of the new central city library, is the work of Morgan Mathews-Hale and Riki Manuel and tells the story of ancestors’ migration from Hawaiki to the South Island. Houlbrooke disagrees that one organisation should have the sole say on cultural consultancy. “The council should be seeking to consult as broadly as possible, and that’s doubly true with matters of cultural sensitivity,” he says. A rain poem in the south frame is one of many features highlighting local stone and local plants. In response to this, McMeeking says the iwi’s treaty settlement secures it as an official voice in the region. 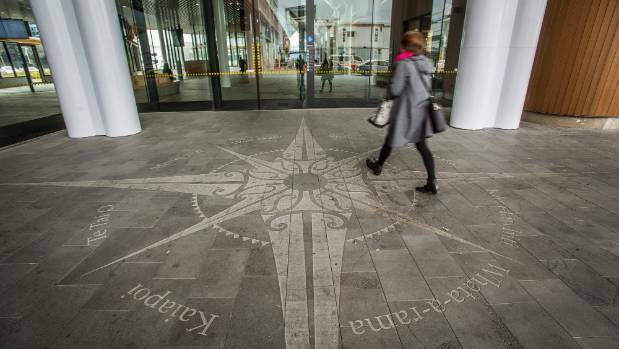 A compass at the bus interchange, the work of Arapata Reuben and Hori Mataki, is of several designs on the wayfaring theme in and around the building. The word matapopore means to watch over, cherish or value highly. The trust operates from a modest office at the Te Wai Pounamu complex in Ferry Rd and is governed by a board of Ngāi Tahu members chaired by Aroha Reriti-Crofts, a kuia, community worker, and former Māori Party parliamentary candidate who did not wish to comment for this story. Financial returns filed with Charities Services show annual incomes have averaged $640,000. In mid-2016 the trust gave Ngāi Tūāhuriri $100,000, representing 10 per cent of its anchor project revenue up until then, in line with its mission statement of contributing to the hapu’s charitable work. The trust appeared to be stung by the naming controversy, but Tikao insists that ratepayers and taxpayers are getting a fair deal. Like McMeeking, Tikao stresses the inclusive nature of the work, saying the trust’s contribution “makes things better for everybody”. “It’s building a sense of identity for the city, and it’s a real point of difference. The tangible things you see, like artworks, are visible signs of identity. They are there to share with everyone. There is a lot of talk about the iwi’s values, but what are those concepts that the trust is inserting into the rebuild?Ngāi Tahu on its website identifies five main values: whanaungatanga (family), manaakitanga (respect), tohungatanga (expertise), kaitiakitanga (stewardship), tikanga (appropriate action), and rangatiratanga (leadership).Tikao says that in line with these ideas, on top of their design work they are helping to educate the public, boosting native ecosystems, and creating spaces for people that are “inclusive, welcoming and safe”.She says the rebuild of Christchurch provides a first – an indigenous culture having influence on the design of a city. Tikao is also unapologetic at the slow pace of the rebuild and the extra time that cultural consultancy adds to the process. 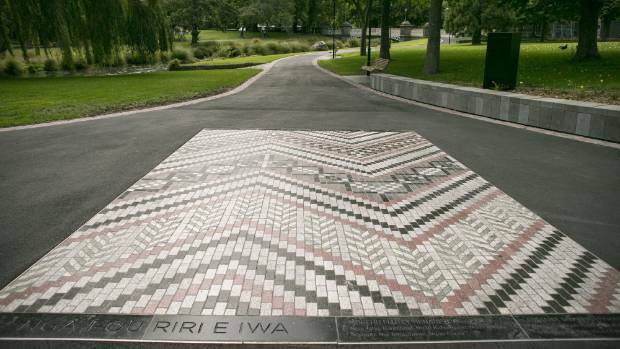 – Thirteen whāriki (welcome) mats – paved designs made to look like a woven mats – are dotted along the Avon riverside representing diverse ideas including family wellbeing, food gathering, and war casualties. – At the Margaret Mahy playground are designs on swinging posts, a painted splash pad depicting tuna (native eel), and a pathway etched with illustrations of Ngāi Tahu stories. 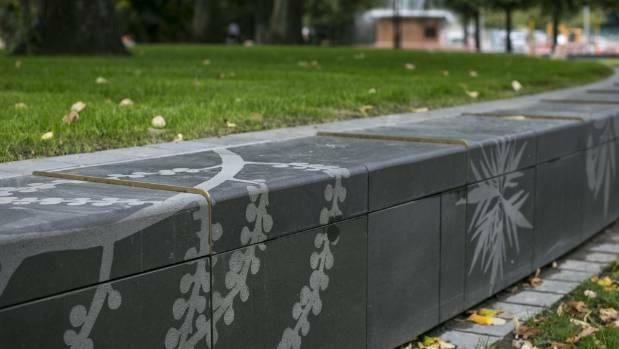 – Victoria Square has leaf and seed designs sandblasted onto low walls, a riverside table depicting a lamprey fish, paving bearing literary excerpts, with an artwork, Mana Motuhake, still to come. – Illustrations at the bus interchange have wayfaring as a dominant theme, represented by a compass design at the front entrance, and ceiling images of the constellations used by early Ngāi Tahu navigators. – The south frame has been built featuring native plants and local stone including pounamu and basalt. – Along the Avon River precinct are an arts trail, a literary trail with quotes from New Zealand writers, and riverbank improvements to encourage native birds and fish. – The New Brighton beachfront playground has a waka complete with carvings, built instead of the sailing ship originally planned, and splash pad designs. – At the new central library, design features include a mural sandblasted onto the west wall.